17 million gallons of gasoline are spilled each year during refueling of lawn equipment according to the EPA. This can be avoided by using a No-Spill gas can and not topping off the gas tanks when refueling lawn mowers, trimmers, and other power tools. This is not your average gas can! No-Spill Research has manufactured the most user-friendly, EPA compliant fuel can on the market today. It’s professional quality construction will provide you with a very long service life. Being self venting and self sealing allows a safe & easy pouring system. It’s thumb button control lets you decide how fast and how long the fluids will flow. The No-Spill fuel can comes with a no questions asked lifetime guarantee so if it leaks or fails in normal use, we simply replace it. 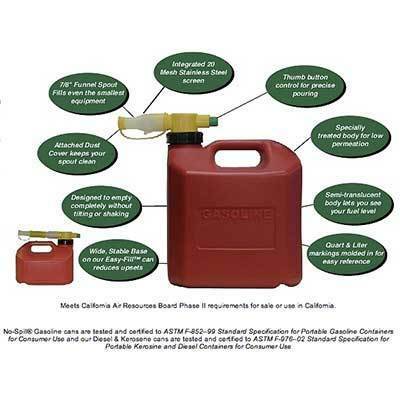 Stop by today and see the real difference between No-spill fuel cans and the others. www.nospill.com has all the details.